I don’t understand when people say that they are bored or have some sort of creative block. For me, my lack of posts here lately has certainly NOT been because of any sort of lack of inspiration. Quite the opposite in fact! I’d had a few things on the boil and they have taken my focus and energy away from here. And then, when they were over, my mind went into overdrive! So many ideas and opportunities that I can’t possibly know which one to start on, so I start a couple and then another one, and then begin worki…OH LOOK! A SQUIRREL! And nothing gets to out there into the world. Then Pip Lincoln wrote about Single Tasking. This really turned on a light for me. My other half is a single taker, and I am a chronic multi-tasker.He writes a list most weeks and crosses the tasks off it as he completes them. I write lists too, but usually use the back of it for a shopping list, or start doodling on it, or create a cypher to write the list in which I forget by the time I get back to the list. Its lots of fun for me, but usually means our home is full of nearly completed projects and enough crafty goodness to open my own shop! He works at his computer with one tab open. Right now I have four, and that’s because I’ve only just started working! I am not foolish enough to think I will ever be a single task kinda gal. Where is the fun in that? But in 2015 I’m going to make sure that I focus on just a few of the goals I have. Yesterday I completed the awesome Braid Creative ECourse ‘Shape Up Your Content’. In the beginning I was wondering a little why I was signing up for this online course, but it was so worth the cost and time to clarify what direction my creative life was heading in. The worksheets were really valuable for getting my ideas straight and Tara and Kathleen know their stuff and share their knowledge willingly. If you would like to know more about Braid Creative’s courses send me an email or ask in the comments. Having completed two now, I’m a fan! So, how did I conquer THE OVERWHELM? A touch of focus, some sifting out of ideas and talking with other creatives about what truly inspires us and supporting each other in achieving those goals. Oh yes…you’ve seen in some of my cupboards! Glad I didn’t let you into all of them! Oh yes it did! Kx. 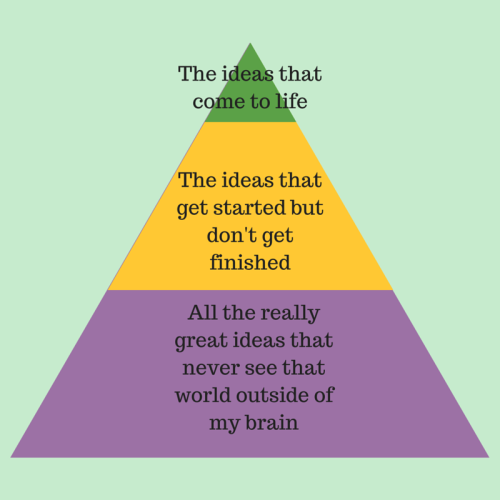 It’s so reassuring to read that someone else struggles with juggling all these creative ideas. I look forward to seeing what comes to fruition for you this year! Thanks Stephanie…its hard when there is inspiration and creativity everywhere! What are your plans for 2015? I’m hopeless at single tasking! I think I’ve lost the skill as an adult and in particular as a mother. I remember being lost in crafty projects as a kid…but I had my mum to look after me! Bless!